Oshinsky, professor of history at NYU and Pulitzer-winner for Polio: An American Story, positions Bellevue as "a microcosm of the city it serves," tracing its development from its hazy 17th-century origins as a Dutch infirmary to its emergence as a 21st-century cultural fixture. Bellevue's mission of providing free care to the destitute means every epidemic and wave of immigration to reach New York Harbor has passed through its doors. 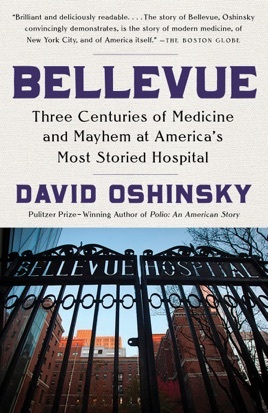 Oshinsky attempts to place Bellevue in dual context, plying medical and socioeconomic history. He struggles with the physicality and aura of this massive institution, which in 1816 added "an orphanage, a morgue, a pest house, a prison, and a lunatic asylum" to its almshouse and infirmary. By the 1950s it had expanded to include 84 wards over five city blocks. Its medical and psychiatric practices have been vehemently criticized, and its political battles have been ruthless. As a result, the chapters overflow with background and sometimes read like scrambled-together lectures. Oshinsky often shortchanges his fascinating subject while discoursing into fascinating, if tangential, asides. When he stays on task, he focuses on a handful of elite physicians William Hammond, Stephen Smith, Edith Lincoln, Saul Farber while the bulk of Bellevue's lifeblood goes unchronicled. Despite Bellevue's rich history, the narrative doesn't truly cohere.